MEDFORD, Ore. – Red shirts are popping up all over the state today, as teachers from all over the Rogue Valley to Portland wore red to show their support for their students. just last week we brought you the story of Ashland educators rallying for more funding in their schools, and today Medford school district went #RedforEd to show their support for their students. “Education is the great equalizer,” Kindergarten teacher, Jessica Fitzsimmons said. Education is a hot topic around Oregon this month, as teachers and educators around the state rally to put pressure on lawmakers for more funding for their students. Local supporters say without that funding, a Rogue Valley education won’t be the same. Lawmakers in Salem just released a proposal called the student success act that would put two billion dollars worth of funding back into Oregon schools across the state, but local educators say there’s more they can do. “Those are just words and plans the things that are going to make the biggest difference in our classrooms is funding, and we need to find a way to stabilize funding in our schools,” Fitzsimmons said. 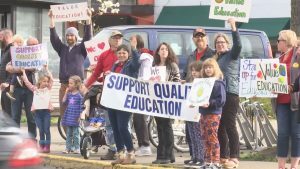 Educators at the rallies this month say they’re hoping that the collective action across the state will send a strong message to lawmakers in Salem about the need for funding in Oregon schools.